Well, not quite that many, but the Congressional Budget Office (CBO) has released its latest in what has evolved into a once-every-two-years series, Options For Reducing The Deficit. This genre was created back in the 1970s and evolved toward its current form in the 1980s, when concern over the federal government’s booming deficit rose to a fever pitch. The idea was to give the Congress an unbiased, on-the-one-hand-on-the-other-hand evaluation of something approaching the deficit-reduction waterfront. There were ideas for cutting spending and raising taxes, and the legitimate pros and cons of each idea were presented in a dispassionate fashion, with all of those options organized by parts of the budget – entitlement programs, by purpose; appropriated programs, by purpose; and revenues, by type of tax. An interested Member of Congress or staff member could use the volume like an encyclopedia to see how his or her target area of the budget might be accessed for savings. 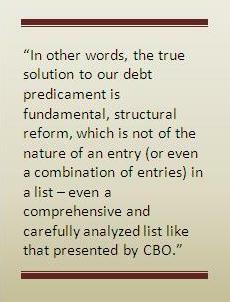 The CBO volume has become an essential building block of all discussions about reducing the deficit. Many deficit-reduction plans have been constructed merely by figuratively checking the boxes of a list of the CBO options. Computer games have been designed to allow individuals in effect simply to choose from among the CBO options in a spreadsheet until they reach a target amount of deficit reduction or (to say the same thing in different words) a target lower level of debt. Such games have been made available on the Internet, or even taken to town-hall meetings so that people can debate their own deficit-reduction choices with their neighbors around a conference table. These games have performed important functions. At the most fundamental substantive level, they have forced people to face up to the size of the budget problem. The more Americans who become aware that eliminating foreign aid and cutting congressional salaries to zero will not begin to trim our mounting debt, the better. And with that reality on the table, getting people together to debate the necessary and far more difficult choices is obviously a good thing. Getting folks with strong preferences for tax increases and against spending cuts, and vice versa, to debate the best combination of both is an important public service. Can we fix the budget deficit by cutting “other” spending? 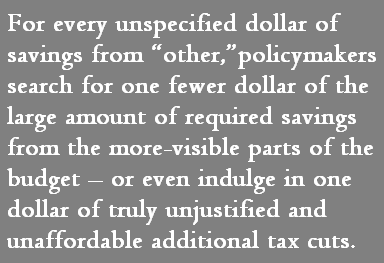 This rather long post points out that recent budget-deficit-reduction plans tend to assume large amounts of savings from “other” spending – spending that does not include the most prominent and problematic programs of government. It presents numbers to provide a sense of the scale of this phenomenon, and then explains why simply assuming large savings from this nondescript “other” segment of the budget could prove quite dangerous. The federal budget has clear trouble spots. In the long term, the projected growth of healthcare spending, primarily for Medicare and Medicaid, will far outstrip the growth of the GDP, and is therefore unsustainable. Revenues have been well south of their historical norm for several years. In fact, for the last three years, revenues have been more than 4 percent of GDP below the lowest level of any year in the last half century in which the budget has been balanced. (There were, admittedly, only five such years.) A deficit equal to that revenue shortfall, 4 percent of the GDP, is by itself enough to grow the public debt faster than the economy – which again is not sustainable. The Social Security system has not paid for itself since 2010, and it is not projected to do so ever again without significant changes of policy. The cost of the Middle East wars is a matter of controversy, but it has added at least $1 trillion, and possibly much more, to the public debt. With all of these well defined and widely known problems, it might come as a surprise that the leading budget proposals from policymakers in Washington – President Obama’s budget, and House Budget Committee Chairman Paul Ryan’s budget resolution – achieve very large shares of their budget savings not in these problem areas, but rather from “other” – that is, not revenues, not Medicare, not Medicaid, not Social Security, and not defense (and of course not interest on the debt, which cannot be cut directly but rather only through savings elsewhere in the budget.) There is the old joke about the drunk who looks for his lost keys under the lamp post, not because he lost them there but because that is where there is light. But why should our nation seek a solution so far away from the problem? Let’s assume for a minute that the economy continues to recover and that the interest rate environment follows normal historical patterns. In ten years, the cost of servicing our national debt would triple – from about $200 billion now to $600 billion in 2022. 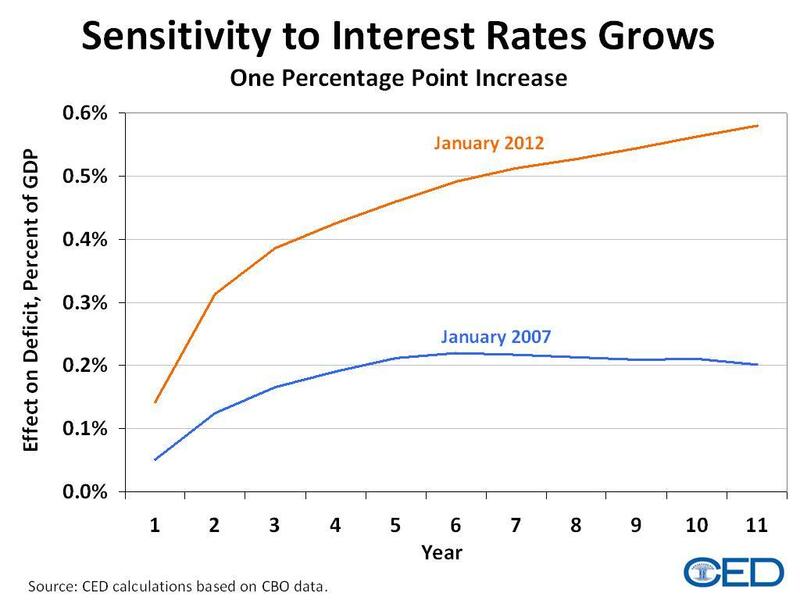 But what if the markets get nervous and interest rates rise more than expected?